For example, just this evening, I read two articles about exercise helping to reduce anxiety and depression. One was very positive about how anxiety could be reduced by exercise. The other was a statistical exercise presented to a professional conference that said there was a statistical correlation of minor improvement in anxiety and depression due to regular exercise. When you dealing with scientists, particularly when they do reviews of previous studies, it is essential that you appreciate that they use statistical analysis which confuses most of the rest of the population. I'm not going to get drawn into that discussion because even though I have studied statistics whilst on a maths course, several years ago. I really have little knowledge to understand in detail this kind statistics. Then at the opposite end of the scale we get raving reviews from people who don't particularly understand the scientific process. A process where one sets up a hypothesis and then sets out to prove it by study or investigation. The scientific process never produces a complete answer, it is always just a step along the way. To return to the two articles on exercise and a reduction in a anxiety and depression I have to go back to what I picked up from reading papers in the shortened versions rather than the full one because I don't have the technical ability to decipher some of the language used. Sometimes one has to accept the evidence of your own information. In my experience people who exercise tend to be fitter, healthier and happier than those who don't. Now in scientific terms that is not a valid piece of information because it is not researched and tested against other data. And it is filtered through my own perspective. To most people their own observations are valid and verified in their own terms, to a scientist this is not the case. How then do general members of the public appreciate the scientific process? Often it is through the popular newspaper or television channel. For instance the Daily Express in Britain often has claims about new drugs and treatments making them seem as though they're about to happen in the next year or so. When reading deeper into the article you would soon realises that this is not the case. What is being talked about is a report of a scientific paper that shows how a particular experiment has succeeded to help a particular type of condition in laboratory conditions or controlled trials. Often the predictions made that the effectiveness of the treatments are the newspaper's extrapolations of the scientists evidence. There are often not really true but exaggerations, of the findings. How is it possible for ordinary people such to understand and believe such reports? On one side we have the scientists report which is difficult to understand an on the other we have a newspaper report that is apparently biased in favour of the positive side of the report without detailing the true nature of a scientist research. To return to exercise at this level, my personal experience, exercise makes me feel good in both mind and body. In contrast with when I had periods of reduced to nonexistence exercise my energy levels were seemed lower and my own sense of well-being has not been at its best. But if I recounted that to a scientist she would want to know my quantifiable evidence, in other words “what can be measured." I'm talking from a personal point of view and that evidence is not available. So my belief from my own evidence is not scientific, just as the newspapers distort scientific evidence and then add their own headlines that distort the scientific facts, my evidence could be argued to be equally invalid. I think the only way to validate what I say is for you to make your own observations and reach your own conclusions. After all no one is ever right all the time. A brand new course which will make my one to one style work avaiable to all. I will take you through the same six steps that I now use with clients in the office. · Foundation - the structure that is common to all anxieties and stress and how our brains work. · Self Esteem – Self Confidence - Self talk - how we think about ourselves shapes our lives – simple steps to change. · Release negative links to the past and move forward. · Planning a new future using the new skills. · Creating powerful visualisations to help put the new future in place. Are Stress Levels Going Down? Recent reports from health authorities have revealed that the number of days work lost through stress have reduced over the last 10 years. Is this a true reflection of the numbers affected and the additional pressures created by the present financial situation? Work place stress is one of the main causes of absence from work according to figures published by the Health and Safety Executive (HSE), http://www.hse.gov.uk/statistics/causdis/stress/stress.pdf their data shows 10.4 million days lost during 2011 /12, an average of 24 days lost per affected person. Compare this with the figures for 2001/02 when there were up to 12.4 million working days lost. Why these numbers have fallen is not mentioned in the HSE report. When the financial situation of the last 6 years is taken into consideration there is large questions as to why these changes have taken place and why the numbers have not risen as would be expected during a time when financial constraints have affected many and job losses and business closures have risen. Have the support services for stressed people improved by 16% as cuts in service have been implemented in the NHS? Is there more effective treatment available? Are individuals learning to self manage these problems? Or could it be that people are just not bothering to seek medical help having realisied that mental health is still the poor relation of the health services in this country? One major plus is the “Improving Access to Psychological Therapies Programme” has expanded and aims to treat 8% of NHS patients. Let’s hope this is a positive move towards improving the importance of treatment of mental health in the UK. Let me know your opinion or first hand experience. When you suffer from anxiety problem you don't really want to understand the full reasons why it happens. Your main interest will probably be how to change this situation and make yourself feel better. Reacting to things the way you do is just not good. One of the most obvious ways to deal with difficult things in situations is to avoid them. Her father went on to tell me that she visited a psychiatrist who talked her condition through with her and came to the conclusion that the best way to deal with that problem of turning right on the road was to stop driving! A perfect cure for the condition but the solution meant being restricted by not driving. It is generally accepted that avoiding a fearfiul situation is a reinforcing behaviour. This is because each time the sufferer avoids the situation they are reminded of what would happen or how he or she would feel, if in this case, she made that driving manoeuvre. Avoiding a fearful situation is not a cure it is only an avoidance of the experience. It will of course mean that the sufferer will not have to face that particular situation. But the fear or anxiety is still there. One model of cure known as "exposure therapy" it encourages clients into situations where they confront their fear directly. This is done in stages with increasing amounts of exposure. For instance a fear of heights may be challenged by getting the troubled person to ascend one or two rungs of a ladder and test out the feelings with each a small step. They are then progressively taken on to greater and greater heights and in theory are able to appreciate rationally that they are not actually in a dangerous place. They also are expected to realise that they can cope emotionally with the exposure to their fear. I've never been a fan of this type of treatment because it strikes me as something like driving home a nail with a steam hammer. A more subtle and less fearful route to take clients down is one that is done mentally through the use of visualisations. The technique developed in Neuro Linguistic Programming (NLP), called "the fast phobia Cure", uses a visualisation technique that allows subjects to experience and change their reaction to the fear by making mental changes within the visualisation in a safe and comfortable setting. By this method the client does not have to experience the full-blown fear as in the exposure therapy. With this technique clients are not exposed to any chance of a full-blown panic that can consume them. The indivdual does not have to handle the full feeling of their fearful situation. Not only that but this NLP method can often be carried out successfully in one session, however, this is not a guarantee of one session only, it can take one or more dependent on the depth and severity of the fear response. I had the opportunity, once, to watch a video of people going through exposure therapy and found it quite uncomfortable to watch people being exposed to their fearful feelings whilst at the same time knowing that I could, as many other NLP practitioners can, help people without exposing them to these extreme forms of their fear. I know which way I would chose to be coached. You may remember the article that I wrote last week about Nearly Anxiety. With a book written by Doctor Luana Marquez and Eric Metcalfauthors from the medical department at Harvard University in the United States. I was somewhat worried about the idea of nearly anxiety and the impact it would have upon those who were troubled by that problem. I'm not as yet read the book but I have read sections of it and some reviews and find that perhaps I had a poor impression of it given by that title. The whole idea of a nearly something does seem to sell down the river those people who suffer from anxiety yet find that the medical diagnosis criteria do not recognise them as having a problem. The concept of Nearly Anxiety is that some people suffer from anxious feelings on a regular basis because of lower intensity or regularity of the experiences they are not diagnosed as having an anxiety disorder; note the word Dis-order, because here is the key. To have a disorder in the system applied by most medical practitioners the client has to conform to a set of criteria set out in the diagnostic and statistical manual, previously called DSM 4 but now that the updated version 5 is available. This new version has caused a great deal of controversy due to the personnel used in its production and some of the new definitions given in it. However I don't want to get into a discussion of those particular concerns. More important is this whole concept of nearly something. In order to put this over I need to become personal and talk about myself and things that happened to me in the past. I suffered from a phobia of my own blood, I and my family, did not know that it was a phobia, in fact the whole idea of a phobia was not something that was in common usage at that time. I also suffered from a social anxiety that caused me to blush profusely, in keeping with my, then, sandy hair. During exam times I was struck with sore throats and swollen glands no matter what the exam was. And then were those strange moments in supermarkets where I seemed to shrink and the world around me moved away leaving me all alone very disorientated and frightened in the middle of a space. Now none of these things were ever overwhelming except in specific situations that were not continuous but they did have quite an effect on my life at times. However at that time I did not know why I felt like that, I did I did not know about anxiety problems or panic attacks and never ever spoke to anybody about things that bothered me. The only one that was apparent to people was the fact that I passed out whenever I cut myself badly. If I had been judged by any of the definitions of an anxiety disorder at that time I would not have registered on the scale. Even so the discomfort that it caused me at times was high. That is my experience and I will not go into detail here because other people will tell you of their sufferings at a much higher level. Many of the people who come to me would not register on the scale of criteria set by the creators of DSM for five. Yet people when they call me all explain to me things that are easily recognised as a strong and lasting discomfort caused by heightened and at times continuous and repetitive anxieties. For example the gentleman who came to me who was becoming more and more terrified of driving because he was worried about having to go to the toilet and disgracing himself whilst unable to stop for the toilet. Just like another young man who came to visit me and suffered panic attacks while sitting at home watching the TV. He eventually confided that as a child he had experienced a ghost in his room at home on several occasions. This fear that he had generated at that time re-occurred as a panic attack while sitting at home. Most people who suffer panic attacks do so in places away from the home and consider the home as a safe place. As you can imagine to suffer panic attacks in the home must be very disconcerting. Again this young man would not have figured at the extreme end of the scale to be considered with a panic attack disorder. So yes I do agree that there are some people who do not qualify on the scale of criteria in the diagnostic and statistical manual either four or five or earlier ones. But to place these people in a category of nearly seems to be-little them, reducing the severity of the effect of their anxiety concerns in the way in which their lives are affected as my own anxiety discomforts affected mine. The language we use in the way in which we talk about other people is crucial to the impact we have upon them. Calling these books Nearly Anxiety and Nearly Depression starts off for me on the wrong foot. Whilst I do understand that the authors are exploring these phenomena in an empathetic way the title is on the cover of their books and may well discourage people from wanting to buy them or read them. Perhaps we could have a competition to choose new titles of these books. What do you think? Just listen to this "Dear Doctor K I’ve always worried a lot. I saw a psychologist but she said that I didn't have an anxiety disorder so she couldn't help me. I can't believe there's nothing to do. Can you help? Now I do not mean to question Doctor K expertise and ability in any way, that is not my intention for he is a medical professional far more experienced than I am. He points out that there is a new classification which is called "Nearly Anxiety" he then draws attention to a new book by two Harvard medical school colleagues Doctor Luana Marquez and Eric Metcalf who explore the idea in their book Almost Anxiety. I know that when psychologists are checking the symptoms that the client has presented the criteria is set out in the book of diagnosis criteria, usually referred to as DSM4, from which most of their judgments are made. If one does not hit the needed a number of repetitions of a particular response pattern of behaviour within a set period of days or weeks then one does not have the condition according to the book DSM 4. This is where the pptential patient has failed to reach the required level of symptoms of the specified intensity. From this the specialists have now construed yet another new condition for people who do not comply with the necessary numbers of points on the DSM system for someone to be considered to be troubled with Nearly an anxiety disorder. Let us just remember what anxiety is; first and foremost it is a natural reaction to thinking about something that could be threatening to us. This then causes us to have a fight flight response that sets the body going through a chain reaction of physical changes. We are feeling fearful. The fight flight response is what happens to the body and mind when we are threatened by some type of danger. The difference between fear and anxiety is that fear happens when we are in direct and immediate threat. Anxiety occurs when we imagine what could be happening in the near future. The same bodily and mental reactions happen for both. Anxiety is therefore a thinking problem before it becomes disorder. The chain reaction brought about by the fight flight response is what causes the body and the mind to generate even more anxious feelings because there is no way for us to respond physically to an imagined threat. The natural bodily response can create an even more anxious reaction because we don’t recognise what is happening to us. Doctor K goes on to appreciate that the correspondent appears to have nagging worry-some thoughts and that they can be distracting her from joyful life experiences. He then makes suggestions about the ways in which people can counter these by taking some action in a very simple and straightforward manner. He begins with nutrition, suggesting a regular pattern of wholesome food rather than unhealthy comfort food and skipping meals. This is a great idea and does demand a certain amount of discipline because anxious feelings can create discomfort in the stomach and abdomen. Sometimes this leads to what is known as Irritable Bowel Syndrome. He then briefly mentions setting good sleep patterns and the need to limit alcohol close to bedtime. He also recommends regular exercise, aiming for 30 minutes five days a week. All his recommendations make great sense. They are the same ones which I recommend to my anxious clients the major differences is he does not include any mental exercises to help calm the brain and reduce the effects of the fight flight response which drives the need to take the actions he suggests in order to reduce symptoms. I know from my own experience that taking the actions he recommends are very very useful to help counter mental reaction to the feelings caused by the body's anxious response. These are natural feelings and not a condition or disorder. These feelings only become a disorder when they run out of control. To reduce anxiety still further these practical activities need to have breathing exercises added to them and also further mental activities. There are several different breathing exercises most of which come from yoga exercises. Probably the simplest of these is diaphragm breathing which is simply exactly what it says, breathing consciously using the diaphragm to fill and empty lungs. To practices sit in an upright position with your feet on the floor, put a hand just above the belly button and as you do that breathe in and out feeling the movement of the air pushing your hand out and then in. Change this and place your opposite hand at the top of your rib cage just below the collarbone now breathe into your chest lifting the top hand. Notice as you do this that the lower hand is not moving as much. Now change again and continue to breathe into your diaphragm making the lower hand lift you will notice the top hand moves less than lower hand. Continue this exercise by breathing in and out comfortably and easily at the end of each in breath pause for no more than one second and continue to breathe in the normal way. You can now use diaphragm consciously for breathing in this way. Should you ever feel anxious thoughts coming on or feel panicky simply return to this type of breathing. There is no need to place your hands where they have been. Whenever you feel panicky or anxious you can practice this breathing quietly so that no one notices and as you do it tells your mind and your body that you are taking control. How does that feel? Alongside this exercise but probably not at the same time you can now begin to practice calming those anxious thoughts by challenging them. For example if you're the sort of person who worries about bad things happening, challenge the thought by ask yourself "is that really the case?" Or you could say. “what happened last time I did this did something terrible happened?" You may choose whatever question challenges that thought that is troubling you. It will take him some time to learn to do this don’t expect it to work quickly and when it does you can find yourself really surprise and pleased. Now you can practise these methods and learn how to reduce your anxious thoughts. Obviously there is more to learn to really overcome anxiety. How do we tell the difference between Anxiety and Depression? I found this intriguing question raised on a Google alert, wondering what the answer would be I decided to take a look. The answers came from an article on www.galesburg.com referring to a recent book by Doctor Michael A Tompkins, a psychologist at the San Francisco Bay area Centre for Cognitive Therapy, entitled "Anxiety and Avoidance." I thought that I would look at the four areas mentioned from my own understanding of anxiety and my knowledge of depression. Before we do it is worth noting that the development of both disorders is not fully understood, there are potential links with genetic background and predisposition to the conditions; environment is also thought to have major influence. It is also quite common for anxiety to lead to depresssion and for the two conditions to exist simultaniously. Focusing on the past versus fearing the future. Depressed people tend to have an inward focus that is negative and can have a tendency to mull over past problems and encounters. Anxiety is caused by setting the “fight flight” response in action when considering future possibilities, for instance an up and coming social occasion may well cause a lot of consideration and worry about others judgements. Anxious people are very active mentally, constantly going through the "what if" process; worrying about what will happen. In this state people have great difficulty calming the mind as the whole system is aroused. The body is alert and will react excessively to sudden noise and other shocks. On the other hand depression is a low state of mind, arousal is down and the focus is internal but passive. The body expresses the internal feelings by looking burdened with slow movements. A depressed person has negative feelings about themselves and the world around them. He/she may well feel worthless, tired and have trouble focusing on tasks due to lack of motivation. Consequent withdrawal from the social world and self-harm is not uncommon. Those troubled by anxiousness, what was called "nerves," find themselves avoiding situations which are potentially threatening. These will include places and situations that could cause discomfort such as the fear of being judged or even places similar to where panic attacks have taken place. As the person who fears the world is often in a state of arousal there is tension in the body often with tingling sensations in the skin. Sometimes there are chest pains, which can lead to false fears of heart problems. Other pains without physical cause are also a focus of worry. Small lesions on the hands and feet that also have no apparent physical cause are not uncommon. Tension in the neck and shoulders often produce headaches. Irritable bowel syndrome often accompanies anxieties as can hyperactivity. Depressed people have little energy and drive plus they show little interest in things previously enjoyed. Consequently it's easy to recognise these people by their slow physical and mental states. Sleepiness during the day is also prevalent. Both conditions can have disrupted sleep patterns, the anxious often through repeated thoughts whilst those in low states are troubled by various disturbances. My own answer to the question at the start of this brief article is that it is possible to separate the symptoms of the two conditions when they exist on their own. Both conditions simultaneously (comorbidity) are obviously less clear, precise questioning from the practitioner should establish the two components of the clients concern. 65 am I past it or is it time for a new start? Really, is this it, I’m 65! What else is left but to get ready to die? Mind you when I was in my early twenties I decided that if I survived to 37 then I would have done well. When I reached 37 I had a mid life-crisis, I became a very unpleasant person to be around; somewhat like a petulant child in an adult skin. The family survived me and I probably became a better person. To be of pensionable age and know that I’m not ready for the scrap heap is a good place to be. I had a greeting from my Dad, he and Mum living in Canada are now 87 and still enjoying life. In terms of longevity I have many more years to look forward to. Ok so I should not seem to be boastful but the whole perspective of life begins to change and I have not come to terms with it, yet! The prospect of my potential declining abilities makes me want to focus more on what I can do and learn how to do them even better. I now have more time to write, read, learn about and teach the things I love most. Where does that place me? It builds in an element of freedom that I have never had since being a child but now I have a different outlook and greater knowledge and experience. Where is my energy going to focus? I love teaching, developing creativity and working at teaching individuals how to help themselves with more effective thinking processes using NLP. Of course there is all the Anxiety Help that I have been developing for over 16 years. Then there is the Toys work plus creativity that I have developed with children from the age of 4 and beyond plus the work that I developed with their teachers. I really believe that I have a great deal to offer. Over these next few days I aim to balance my internal conflicts and begin a plan for my new liberated life. Watch this space, as they say………….. This is a real eye opener I often deal with the idea of self esteem yet have never placed it in this context. Being vulnerable and accepting yourself as you are is the building place for all real personal change work. Have you read the story about the boy Joe Thomson who is unable to fly home to England from Abu Dhabi because of a fear of flying and other forms of transport? The Daily Mail reports that behavioural therapists and hypnotists had diagnosed him with a severe anxiety disorder and flight phobia. Sadly none of these experts have been able to help him overcome his fear and encourage him to take the transport needed to get him back home. His father, Tony, used to work in the United Arab Emirates up until last year. Joe has spent the last 12 months expressing the fear that he is unable to travel home in any means. The family is threatened with potential bankruptcy due to the expenses of the boys prolonged stay. His mother and sister are at home in Western-super-Mare where the family home is. The house may even have to be sold due to the rising costs of the boy’s life in Abu Dhabi. I find this case puzzling because it does not seem to fit in with common kinds of phobias. The Daily Mail reports his father as saying: "The hypnotherapist and behavioural therapists he has seen said it is not all about flying. There's something blocking him in the UK. He now needs some kind of medical intervention to prise open the secret." The boy has been prescribed medication to lower the symptoms but he still refuses to come home preferring spending time with friends watching TV playing rugby and surfing on Facebook. A simple phobia can be overcome relatively quickly by using either hypnosis or Neuro-Linguistic-Programming (NLP). The techniques used are able to re-route neural pathways in the brain so the old patterns of behaviour are no longer re-enacted. If we view phobias from the point of view of a well-formed habit this habitual behaviour is considerably reduced because the brain now follows a different neural pathway overriding the thoughts associated with the previous phobic reaction. In the case of more complex phobias similar processes could be used too but there are usually other factors associated with this type of phobic reaction. These can be related to traumatic experiences and fears caused by abuse or threats to a person’s safety from other sources. With these types of anxieties some of threatening stimuls can be imagined or mentally created by reliving past experiences. Our brains are capable of overrunning our good sense and creating uncomfortable scenarios due to the Fight Flight Response. This response mechanism, which is associated with our primitive ancestors, prepares us to do battle or flee when we are threatened by some form of danger. This is because parts of our brains repond emotional to real and imagined threats. Despite the complications these phobias can be worked on and reduced considerably over a limited number of hours. There is no need for people to go through uncomfortable desensitisation processes in order to cure a phobia. Modern processes are able to get to the bottom of the problem and more generally very quickly bypass the previous phobic response. Joe can be helped to overcome his phobia/fear by the use of NLP techniques that will either guided through a series of visualisations and associated feelings or by an alternative process that reduces the effects of past traumas in order for him to lose his fear of flying or other means being transported. Some have suggested that the tranquillising treatment used on the TV star B.A. Baracus in the series “The A Team” could be used. I would not recommend this approach as a new fear could be established which could result in a distrust of those around him when it came to discussing or contemplating holidays or visits by one or other form of transport. I believe that I could help Joe overcome his problem given the chance to fly out to meet him. Want to learn how a flying phobia can be cured? 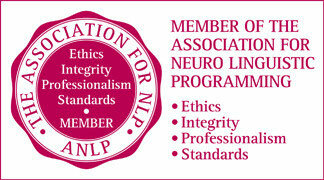 Contact Ian Bracegirdle BA, NLP Master Practitioner. Sign up in the box up to your right. Which comes first, Stress or Anxiety? Lets look at it this way. The Amygdala and the fight-flight routine were developed in the primitive brain at a time when people had not developed the higher functions that are associated with the neocortex. For those who are not aware the Amygdala is part of the mammalian, or more primitive area of our brain. This part of us is associated with survival and emotions. The neocortex on the other hand deals with logical thinking and also our wonderful imaginations. When we are in a situation where there is a threat the amygdala in our primitive ancestor’s brain sent signals to the body preparing it for running or standing and fighting. The same bodily responses were applicable to either the decision to run or stand and fight. In the first instance adrenaline would flow into the blood stream preparing muscles for action increasing the heart rate and breathing. Other less needed functions would reduce. The body is now stressed and ready for action. This stressor is fear that is a result of the threat; our brain and body are being stretched in response to this danger. Being stretched can be viewed as stress. So, yes, in my opinion stress comes first in may cases of anxiety because our more complex brain with the neocortex is being stressed in order for the fight-flight routine to be brought into action. Now our amygdala brings the changes about just as quickly but it also reduces our ability to think logically as the higher brain is taken over by the emotional brain. The other very effective stressor is the wonderful imagination. Our primitive ancestors appear to have had limited imaginations, once the threat had gone their bodies returned to a normal state. Then life continued. Imagined actions can have the same emotional effect upon our bodies as the real thing. We are able to imagine a threat and create amazing internal imagery or complex verbal scenarios about potential dangers. When these are recognised by our amygdala the same arousal system is brought into effect. Something that may have stressed us once only provides the fuel for thoughts that bring it back into mind. Say you had a run in with your boss about being late some time in the past. The next time that you are delayed on your way to work memories of the first run-in come to mind and the original scenario can be imagined. You have created the stress in your head with the same result as if the boss were right there giving you a dressing down. Anxiety is created in the mind, as there is no direct threat, only an imagined one. Fear is what happens when there is an immediate danger. Anxiety is what happens when there is a potential or imagined threat. Yesterday you could have read my thoughts on anxiety being a part of all our lives as a daily occurrence. Not to say that all people feel anxiety everyday but that anxiety due to some situations is a potential possibility everyday. Anxiety is an ever present for some people as it has begun to over-rule well-being. Feeling anxious has eroded the general sense of well-being and infiltrated the mind in situations where it is totally inappropriate. The professionals call this a disorder and they have created many differentiations and names for it when really anxiety is only the over stimulation of our fight flight system. Let’s think about the word Disorder. I like to think about it as the way a new pack of cards is used and from being pristine and brand new it becomes ordered in different ways each time the pack is shuffled the order is disordered for the original pack the went ace, king, queen, jack etc. to one that could be rearranged in any order. The brain can take on various configurations, adapt quickly to new situations and experiences, in effect become reordered. The cells creating dynamic new links with other cells, new learning changes the composition of our brains and subsequently changes our minds. Habits can be formed very quickly. Thought patterns can become established almost instantaneously at times. Just so anxiety disorders. As we can take the pack of cards and reorder them so we can to begin changing the configuration of our brain and mind and build it to run ourselves more comfortably. Where do you begin? You begin by learning to think differently. See the next post for a starting place. You may well remember my earlier story about Artie the anxious cat. Well despite having made an alteration to Artie's cat flap he is still having problems. In fact the same problems. The big bully boy cat who we call Sid, named after the famous Sid in the book 6 dinners Sid, it's still invading Artie's space in the utility room. As long as the weather is fine Sid is always on the prowl looking for an opportunity to fill the his large belly. Sadly Artie's food is the focus of Sid's attention. The size of two small 2.5 kg Arties Sid dominates the district and burgles houses where ever he wishes. This causes our little black cat to be very un-nerved, seeing him leave the house in his highly nervous state you would think him to be a very sad little beast. When in fact in company with his owners he is a very happy little soul. We decided that a new cat flap was needed to reduce his anxiety. This led us to take Artie to the vets to be chipped. Plus the purchase of a new more expensive catflap that would open in response to the proximity of his new electronic chip. We were advised by the vet staff that this catflap could not be opened from the outside by a cat's paw. Sadly this was not to be the case. Soon Sid and possibly some of his counterparts discovered a way to open the flap, also the flap did not closepropperly at times this also allowed easy access. Once again Artie's food was being stolen and he was showing signs of being terrorised and anxious once again. Despite our vigilance he is still being made anxious by the regular invasions during the day and evening. I often walk out with him at night in order to reduce his anxiety. He is a character off the night and finds it difficult to resist the dark where he seems completely at ease, being a black cat. He is also something of a hunter and seems to enjoy catching his own food. We are making enquiries about increasing the efficiency of the Flaps ability to close correctly, as at the moment it continues to stick on the draft seal. This of course does not help the poor little cat. Our only actions are to treat him as lovingly as possible. Which is a very easy thing to do. I'll keep you informed as we make progress. Can I offer a few thoughts? We are all AMAZING. Just the sheer fact that we are alive and human going about our daily activities is amazing. At times we tend to focus on all those aspects of our selves that stand out. And if you take the time to notice those tend to be the things that we feel negative about ourselves. I often listen to people talk about what is wrong with them, not what is really good about themselves. It seems to be in our culture (I speak from an English point of view). When you think about all the things that you can do, some of them that others think are amazing, you can appreciate yourself in another light. Think about yourself as the intricate and wonderful biological being that you are. That incredible brain working away in your head is almost impossible to conceive due to its complexities. It's yours, your driving force behind being you. In contrast as one of 7 billion you are also quite ordinary at the same time as being amazing. Look at the world around you. All very normal and usual but at the same time extraordinary. Where do you put your attention? Do you focus on only the negative thoughts about you? Or can you keep a balance? As someone who suffered from what I now feel were low level but persistent anxieties I know the value of developing a persistent positive attitude. Positive towards me and all those I come into contact with during the day. Yes I know it can be hard sometimes. Allow yourself to find the jewels in your day to day experiences and celebrate them, tell others about your achievements, praise others and enjoy the wonderful world around you. Accepting Anxiety as a Starting Point!! There is one thing I'm sure some of my clients get tired of me talking about, that is the subject of acceptance. There are several ways of dealing with the self when you have internal blocks, crises, or some kind of anxiety that is really getting into you. You could for instance just take it and go along with it and not take any action whatsoever. You could do battle with it, that of course would be fighting yourself because those things are internal. On the other hand you may want to ask someone to help you. I'd suggest the starting point as being to simply accept what you have and exactly what your experience is now. Then use that as a place to build from. I'm not suggesting a fight with yourself because that would be very painful. I'm not suggesting that you ride with it and just let it overwhelm you. Nor am I going to suggest you attempt to ignore it. And personally I would not want to use medication. For me acceptance is the key. Simply a matter of saying to yourself I am here this is how things are with me at this moment and I want to do something about it. There in that statement is an acceptance of the truth of the position and a decision to do something about. Those people who decide to do battle with their innermost feelings, anxiety depression or any other troubling state of mind will be doing battle with them-selves. The reason being because it is a state of mind and a way of thinking that we're dealing with. You cannot fight your thinking but you can understand it and begin to make changes in how you think. Just consider this, that feeling that, state of mind is within you and doesn't exist outside of you. It may seem as though those feelings are driven by exterior factors. However they are not. You accept information from outside yourself and interpret it due to your mindset and mental state. This feeling, this anxiety, this state of mind and body is yours. It does not belong to anyone else it only belongs to you, you are the one feeling what you feel in your own unique way. No one else is able to experience what you are experiencing. There are other people around you who may well be suffering from an anxiety problem but their anxiety is theirs. You are probably aware of other people’s responses to your anxiety but often it is not very supportive or helpful. The reason for this is simple, unless you experience an overwhelming anxiety yourself then you have no idea whatsoever of what it feels like and how it reacts on your whole mind and body. And in that fact is another reason to accept. That is to accept that most people, even those who are close to you and really care, cannot fully understand. People may be sympathise, empathise and make the right noises but they don't really understand what you are feeling. I've probably stated my thoughts quite strongly but I know from my own experience that working with myself and learning how to work my mind was what took me through my anxieties. Everyone is different and has their own way of dealing with anxieties and most people are capable of learning how to change the way they deal with themselves. Of course once you have accepted that you have a problem with your anxiety and want to make changes and then there's the need to commit. The time to make a decision is now; decide on your best way to begin to change your life for the better. The Big Grizzly Bear and the one behind the next Tree! Maybe!? Imagination is one of our human triumphs! Can you think of some quirky thing imagined by another human being? How about “Rubik’s Cube,” it is totally useless apart from boggling the mind. You know I love to have my mind boggled; it is one of the delights of being human. For millions of years the human imagination has been responsible for an amazing array of creations. Our imaginations are virtually boundless. Wim Wenger has developed a system to extend our ability to be creative by using what he terms “Image Streaming”. He use a method to tune into the constant activity of the brains deep level imagination and record just some of what is going on in there. Have you ever sat quietly for some time and have found yourself entering into a semi-waking dream state? When this happens I am amazed at what is going on in my brain below my usual conscious level. I often find images and sounds but more often than not there is some form of dialogue going on, a conversation between two or more people. I find that I can hold it and follow the scenario for a short time but when my mind returns to a general normal awareness then the scene disappears. As with dreams the content fades quickly and disappears from my conscious memory. I am now certain that this level of imagining is going on all the time in my below conscious mind because I can tap into when I set myself to. It does not take any practice all you have to do is tune into as Wim explains in his work. But more of this later. Back to the bear. A few years ago I was visiting my Mum and Dad in Canada. As part of the trip I had promised my self some time walking in the mountains near Banff. I decided upon Kananaskis as there was a good hostel there with easy access a nearby hotel for a bit of civilisation in the evenings and of course good high level walking safe for beginners. The first day I walked near the Olympic ski slopes and had a pleasant easy walk. Before setting off I had asked about bears and been told to make noises as I walked to discourage bears. By bears I mean small brown ones and the much larger Grizzlys. Both are common residents in this part of the wilderness and also dangerous. My instructions were simple Yodel, clap, sing, whistle or make regular noticeable people noises. These sounds are to alert the bears to human presence and telling them to keep away. I saw no bears on my first day. After a good sleep in the hostel and a decent breakfast I intended to attempt another easy well walked route to a small lake. On the way I met a group of friendly Americans, now residents of Calgary and regular walkers in this area. They invited me to go up higher into the mountains with them so I tagged along and ascended to nearly 8,000 ft.
On returning to the hostel I was told about a treat that I had missed. Several Park wardens had been moving two young male Grizzly Bears up the valley from a walking trail where they had become a potential danger to walkers. We had missed the entertainment whilst dozens of others had watched the progress. After dinner as the residents of the hostel talked I heard a great bear story that centred on this very place. Dave had been staying here last year. One morning he had risen early and set off to go for a short walk in the early sunshine. He opened the door to step outside and came face to face with a large bear that was about 5 metres away. Both of them froze. In a split second the amygdala of each took control of their reactions. Adrenalin coursed through their blood streams, hearts speeded up, breathing rate increased; both were ready to make a rudimentary decision, run or fight. They both saw the other as a threat and turned, the bear to lumber back into the woods and Dave took refuge behind the door. As Dave stood behind the door he was very aware of his pounding heart and quickness of breathing, he was shaking at the same time as he felt a sense of elation he was he was also aware of a great sense of relief that he was in a safe place. Both Dave and the bear had experienced a fear-full incident. They had also witnessed the body’s reaction to fear when the almost instantaneous take over by the amygdala had changed their whole physiological state. That’s what happens when you are frightened. Two days before, when I had been walking alone, making noises to let the bears know I was approaching I was feeling a sense of anticipatory anxiety. I was not overwhelmed by one of the amygdalas* sudden gear shifts I was in a prepared state. I was operating form my logical brain and as such was in charge of my emotions. If, on the other hand, I had expected a bear to be behind every tree then I would have been in a state of anxiety. Because I would have triggered the amygdalas fear reaction but with out the need for fight or flight. A state of high arousal without an outlet, this is anxiety. To return to Wim and the imagination, when I am anticipating the appearance of the bear in my anxious moments my imagination is working as normal but doing the “What if trick.” Could I use my imagination in another way? Of course, it’s a matter of taking control, that will take time and practise. Yes it can be done. *To explain the amygdala is a small section of the brain which controls some of our basic emotions, especially fear. For instance you may wake up in the morning having had a poor nights sleep and emerge from your bed feeling tired and not really ready for your day’s demands. Think back to a time when you have had a similar experience and how you remember feeling. Now lets imagine that a really good friend comes visiting or calls you on the phone. What happens? Do you continue to stay with that low feeling or does something else begin to happen? Does your mood change as you talk to your friend? Does it depend upon the friend and how positive she is or do you explore your low feelings with her? OK let’s switch the scenario a little. You start off in your low feeling; your friend calls and he is really buoyant and pleased that he is going to do a really demanding job. He tells you all about his expectations and his positive feelings. How does that affect you? Do you continue to feel the same or does your mood shift to reflect his? As you go through your day does your mood stay constant? Does the music that you listen to change your mood? How does the current News effect how you feel? Do other people affect your mood? Many people that I talk to seem to be affected by the experiences that they have around them and reflect that mood back to the people and world around them. Then there are the others who appear to come to very situation and appear very upbeat and always seem to reflect the best of people back to them. What’s the difference? Is it the way we are created or is it possible to change and develop a more positive outlook to use all the time? Have a go at keeping a record of your moods during a day and sense how much yours change or remain constant. Notice how external events affect you. Then when you have done that come back to the next part of this series. Do you ever feel like all is not quite as it should be? That you are not really in tune with the rest of the world? And have you ever wonder why? It something which I have gone through periodically only to reach one of theose periods of clarity. After this things seem to stabalise for some time and then the nagging feeling starts again. It is like being out of balance. This feeling results in a new search. I know that ther must be an answer to the block or feeling or state that I am in. The search will often begin by just being open to new information. I believe that at the centre of us all is our true self the real sense of who we are. It is hidden for most people. this is where the trouble starts. Over the years I have gradually been rescuing this hidden part of me. The first step was the nagging feeling, "something is not just right." That led me to Lou Tice and then on to Neuro Linguistic Programming. Now the Journey had really begun. Before this there were many influences, mainly books and films plus some other people. One author that always stands out is Carlos Casteneda because he wrote about a different view of the World and Universe. Currently I have been reading Joseph Riggios The State of Perfection. This unique book has allowed me to recognise a way to reach that hidden sense of a true self with both my self and others. It is more direct and subtle than my other approaches have been. A real break through. So on to the next stage of the journey. Do you want to follow your journey too and find your true self and drop the anxious feelings for most of the time? Yes. Then just begin by deciding that you will begin. When working with clients who have an anxiety problem I usually ask the following question, “Is either of your parents or main careers troubled by anxiety? Generally the answer is yes. It is occasionally the case with what are called simple phobias; sometimes they too seem to be passed on in families. I have even come across a family of five all of who were troubled by OCD, Obsessive Compulsive Disorder. That is mother, father and three adult children. Let's begin at the beginning. When you were born you had three inbuilt fears; fear of abandonment; fear of heights; fear of loud noises. The question to ask yourself is, “Where did these other fears come from?” Anxiety is a useful type of fear in that it helps us to anticipate when and where there are potential dangers. The young child does not have the knowledge to anticipate potential danger just a reflex action when placed in the situation. To have an anxiety there has to be a thought process. To be anxious is a developed skill. Excuse me if “skill” seems to you to be the wrong word here. Let me explain. Lets return to the young child. At birth she is capable of some useful reflex actions which aid survival. All other things have to be learned and children are pre-programmed to learn. The baby has the potential to learn many physical and mental skills. Take speech as an example. Most mothers will talk to her baby as a matter of course long before the child can understand. Speech develops over time as the baby makes random noises which develop into sounds that seem familiar to the adults. These sounds are then rewarded and a whole vocabulary begins to develop. It is a long process to develop the skill of communicating using speech. Similarly with anxiety a child has to learn to anticipate in order to feel an anxiety about something that is going to happen in the future. As parents are the first role models, they then could influence the child’s behaviour, if they have an anxiety about a feature of life. For example a parent who has a fear of dogs will react in the presence of the animals and the child will sense that dogs are potentially dangerous. Whereas a parent who enjoys the presence of dogs will teach the child a different reaction where dogs are seen as friendly. With all learned skills once we have practiced and practiced they become absorbed into our subconscious and taken as a fact of life. If you can speak fluently you would have a difficult time remembering exactly how you learned this skill. We know that we don’t know. We are conscious of doing the thing we are learning. We can do the skill without thinking about it, because it is firmly fixed in our subconscious. To put a golfer off the shot just ask, “Do you breath in or out on your back swing?” Then watch the result. All anxieties that become a problem are firmly fixed in the subconscious where that operate outside of conscious control. The thinking process has become an habitual process. The anxiety sufferer no longer has conscious control. This is when it becomes a problem and leads to what are termed disorders. A starting point to break the chain of thoughts could be related to the fifth part of the learning structure above. To teach a skill you need to retrieve it from the subconscious and break it down into steps in order to relate it to the pupil. Just a few points here; people who suffer from Post Traumatic Stress (PTSD) will obviously know where their concern began. PTSD is a very interesting example of the way in which the mind can make rapid, or almost instantaneous changes due to one event. Our brains are plastic and can be rewired both slowly and rapidly. It is possible to unlearn anxious behaviours and replace them with more positive ways of behaving. The place to begin is by accepting the position your in and then seeking the right kind of help for you. This is a section from my booklet What To Do About Your Anxiety. Acceptance is for me the starting point to deal with any place where there is a problem in your life. First you just say this is how it is. Then next you ask yourself what do I need to do to get out of this concern. Do Not Fight It understand, learn and ease your way through it. Give the exercise a read first and then do it. Please let me know how well you succeed. Really, it is hard to fight yourself! It hurts even more when added to all the pains that you are already suffering. Imagine punching yourself. It hurts. Now imagine repeating it on a regular basis. How long would you want to continue doing it? I would like to ask you to ACCEPT where you are now in your development and use it as a place to grow from. There are many things in your life that you accept at this moment. Think for a moment of all those chores you do because they are necessary to the general day-to-day demands of life. There’s nothing special about washing-up or cleaning teeth or sorting out the laundry. Each one of them is just something you do because it’s necessary to do. It is not something you get excited about. In contrast think of how you can accept your ability to be creative or excellent in an area unique to you. It feels normal to you. 1. Sit in a quiet place where you can concentrate. Make yourself comfortable. 2. Begin to think about something ordinary that you do regularly. Examples are cleaning your teeth, doing the dishes, or any are one of those activities we mentioned above. Choose an activity that has little or no emotional content. Do not choose something that you really like or hate. 3. Think back to a recent time when you carried out this activity. Remember what it felt like to carry out your task. Activities like these have little or no emotional content. Just a normal and every day routine activity for you. 4. I know that there is not much feeling with such experiences, just sense the normality of. Really understand that feeling and sense what it means to you. 5. As you do this begin to bring to mind your anxiety. Beginning to sense it as something that is a normal part of you, an everyday part of the way that you live your life. In the same way as you accept that simple task you do regularly. Accept the fact that you do anxiety regularly. It is a normal part of your life. Just like cleaning your teeth. 6. Yes I know you might not feel happy about it but it is a part of you and the way your life runs. 7. If you find this difficult to accept them just allow the thought to develop in your mind over the next few days. 8. You can of course practice the above routine to the end of number five as regularly as you wish. This is the core of where you are going in this book. As you accept your anxiety you can also accept your ability to change. You can write this affirmation in your own words in your notebook. As with most affirmations it helps if you repeat them with positive feeling daily. I did mention earlier that I would like you to commit yourself to a small celebration on the 19th day of this course. How you choose to celebrate the completion is entirely up to you, it could be a special treat for yourself by yourself. On the other hand you may wish to celebrate with a small group of friends or family. You may also choose a day that does not fit in sequence with the rest of his 20 days. You could select a weekend or evening that fits in your schedule better. Write your commitment down in your journal and you can then begin to wonder about how you are going to organise the experience. Put it in your diary. Can you learn to accept your anxiety? What have you learned about yourself so far in light of this course? Well done you have now completed the first two days this course. I have reproduced it here because it shows a worrying trend in the rise of aniety and the use of Medication for the condition. I thought that I would pass this section on to you. Remember anxiety is a thinking problem and can be resolved by making a change in your thinking. It can take time but it can be done. "Research by the NHS Information Centre has shown that since the onset of the credit crunch four years ago, cases of people being admitted to hospital for anxiety disorders and panic attacks rose by one third. Findings suggest that out-patient appointments could also be on the rise for the same conditions. Some experts believe the rise may be caused by individual’s worries about finances, job security and other concerns associated with the current economic situation. The findings have been echoed at Anxiety UK, where the charity has seen the amount of calls to the helpline double and emails requesting support rise 400% in the period of January to February 2009. Since then requests for help have continued to rise, with a large number experiencing Generalised Anxiety Disorder (GAD). Further research by The Co-operative Pharmacy has shown that the use of anti-depressants to treat anxiety has risen by 26 per cent since 2007, with a total of 49.8 million prescriptions being written in 2010/2011 (an increase of 10.3 million since 2007/2008). According to the National Institute for Health and Clinical Excellence (NICE), anti-depressants should be prescribed only after lower intensity interventions, such as self-help, have been exhausted. But the number of anti-depressants prescribed (equating to one for every man woman and child in England, according to recent reports) shows that this may not always be the case, a fact which Anxiety UK knows only too well. “Anxiety UK’s finding suggest that 60 per cent of our members were offered medication as a first step to help with their anxiety,” Nicky Lidbetter, CEO of Anxiety UK revealed. While the government’s Improving Access to Psychological Therapies (IAPT) programme is going some way to adjust this figure by offering other interventions before or in conjunction with medication, Anxiety UK continues to experience increasing demand for services, particularly for Cognitive Behavioural Therapy (CBT) via telephone and web-cam, access to peer mentoring and access to specialist helplines run by people with personal experience of anxiety. Today was a beautiful day. Then, a shotgun pellet hit me! Luckily it was only one and at low velocity. You can imagine the sort of questions that were going through my mind. However let me start at the beginning. We had arranged to go for a walk along the Canal with Pippa and her two sons; Mathew and Adam aged 4 and 2 years. Great boys, full of fun, questions, imagination and that amazing bright, openness that small beings have to the world and what is happening. The canal, The Leeds Liverpool, is the very close by and used by many for recreation of all kinds. There are always people running, strolling with children, walking the dog, cycling, fishing, bird watching, chugging past in long boats and generally messing about. As the weather was bright and clear there were a lot of us doing the same sort of Sunday afternoon things. As the terrain is flat it is easy walking for everyone. Our part of the canal is like a long narrow park running between houses. To the south is the River Aire and to the North Ilkey Moor. After the canal flows along about a mile from our staring point the town of Keighley is to our right. From here on the number of houses become smaller and the whole area is more rural with golf clubs and farms. There were numbers of sheep and lambs grazing in some of the fields. The warm sun and scenery was creating a typical English spring Sunday. The six of us, Dot our son Sam, Pippa, Mathew Adam and myself were walking and talking and just enjoying the company and wonderful scenery. Even the bell-less cyclist seemed to be in good humour and polite as the slowed or stopped to pass us. Cyclist without bells can be something of an annoyance to all walkers and dog owners. As the terrain became more rural the smell of animal manure being spread became obvious. Mathew immediately wanted to know what this was and why. I explained to him that the farmers spread the “muck” on the fields to help the grass grow. We then watched a Land Rover on the track below us pulling a cattle box slowly along to a farm below us. Farms and their buildings in this area can date back several hundred years and many of them have been bought up and been redeveloped as out of town homes for city dwellers seeking rural retreats. But not this one, it has certainly been there for at least three centuries and looks well worn and in need of some maintenance. Then we spotted the heaps of cow muck in the farmyard. Matthew was somewhat appalled by the huge piles waiting to be spread on the fields. I promised to show him my bags of horse manure when we returned home. He was quite intrigued as to why I had horse poo! Somebody said “There’s a man with a gun!” I think it was Dot. Below us, standing by a barn was a man facing away from us with a long barrelled shotgun. He seemed to be wearing clothing which blended well with the scenery. In fact it would have been difficult for me to see him unless his position had been made clear to me. He was standing stock still, his gun held in both hands pointing downwards. He looked to be in a state a focused concentration. Alert for any signs of vermin or game. At this point we were behind him and out of his line of sight. He could well have been aware of us for we were chatting and Adams push along bike, easier to keep a 2 year old happy on a walk, was rather noisy. A minute or so later we had walked about another 50 metres or so stopping to admired a dragon illustration on a canal barge. Pippa, Adam and Dot were a little further ahead. Sam, Mathew and I were just parallel with some leaved bushes, most other trees still being bare from autumn moulting. The leaves beside me twitched violently. Something hit the side of my face just by my ear. It stung like some one had flicked me with a large elastic band. I realised immediately that it was a shot from the gun we had seen below held by the man near the barn. I realised almost at once that the pellet probably ricocheted from one of the trees as a direct hit could have caused serious damage. A state of confusion blurred my mind. Had I been shot at, or was it just fluke? Why had the man fired towards a footpath with families walking past? Could this be the start of one of those killing sprees that have happened recently? The man did look sinister in his camouflage standing still by the barn. We walked away from the area warning approaching walkers of what we had experienced. Then I decided that I better phone the police. If it was an accident it needed reporting. If worse it needed dealing with. Now! One final question for you. What was I experiencing, Fear or Anxiety? Artie the anxious cat was a rescued cat but his story has a twist. We decide that it was about time that we had a new cat about 6 years ago. The search was on. 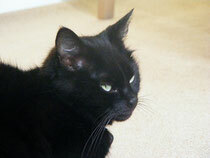 I had a client who recommended us to Jenny at the Cat Rescue. One evening we made our way over to Allerton to view cats and hopefully choose one to take home. The house had several house cats around five or six I think. However, out the back there were huts and cages full of cats of all sizes, shapes and colours. I was determined not to get a psychotic cat just a real genuine moggie. We followed Jenny around her large cat family as she told us the tales of some of them. Towards the end of our tour we went into a small building that had three cages of small cats. In one cage were three tiny black kittens. Jenny explained that two were brother and sister and one was the last of a litter the others all having found homes. As the cage door opened two kittens retreated hurriedly to the back of the cage and one made its way to the front, rolled on to its back for a tummy tickle and purred. We saw a few more cats and then had to decide. Dot confided that she was confused and overwhelmed with cats. Sam and I both knew who we were taking home; it was the little black kitten who did the roll for the tummy tickle. He had chosen us. He was about 9 weeks old and a very handsome, being black all over and very petite. We had all the things ready for him at home, bed, litter tray, dishes, food and water. He was a real scaredy cat. In our lounge are two large, almost ceiling high, cabinets our new resident decided to hide behind one! It was impossible to get him out. Eventually hunger got the better of him. That night we settled him down in the utility room in his new bed and then went to bed ourselves. In the morning, poor kitten, he had got it all wrong. He had used his brand new bed as the toilet and slept in his litter tray! Poor little guy he was very confused on his first night alone. We had learned his life story up to this point from Jenny the night before. Our anxious kitten had already experienced some of life's hardships. Soon after he and the rest of his litter were born, his mother was taken away. The man who owned and looked after the cat lived on his own. Not wanting to lose them, he began bottle-feeding the six kittens. He must have been really devoted to them because they all survived the loss of their mother. Where had his mother gone? She had been rescued and taken to the cat rescue. Some very helpful soul had seen her scavenging in the bins behind the houses near her home. Heavy with milk she was dragged off to the safety of Jenny's. The owner of the kittens carried on feeding them diligently as they grew and became more adventurous. I have nothing but admiration for the owner he did a wonderful job. The kittens would be found suitable homes and also sterilised. Jenny believes that there are too many stray cats caused by unwanted births. That is how we got our Artie the Anxious cat. He has two anxieties; Separation Anxiety and a General Anxiety. This is Artie. I am his person. There was once a big debate in the Guardian Newspaper's letter page about the diffference between dogs and cats. The conclusion from the coorespondents was dogs had owners and cats have STAFF! Now Artie is not really like that. He is tiny cat who weights in at qbout 2.5 kilos, that is 5 1/2 lbs. That is tiny for the standard UK cat who often tip the scales at 5 and 6 kgs and sometimes more. Because of his size Artie is bullied by the larger local cats. Two of them we know burgle his cat flap and steal his food. Artie takes refuge in our lounge and watches with trepidation. He is a fear full cat. In fact he is an anxious cat. He sits on the steps as though doing sentry duty. He flinches at all noises that come from the kitchen and utility area. When you understand Arties history you will notice the similarities between his problems and those of the human population. I am not trying to make light of peoples suffering but using Artie to illustrate the problems in an alternative way. The number of people affected by Chronic Anxiety problems is enormous. The Uk has an estimated 13% of the population affected at any one time. The USA has an estimated 18%. The figures for the rest of the world are lower but again are high at 10%. You can add to this my belief that many people do not register in these figures as they never seek attention. From having had some contact with people and substance missuse I have recognised that many in this group seem to be covering up real anxieties by the use of drugs or alcohol. The good news is that all these concerns can be overcome. However it may take time to do so. There are some but few quick fixes. I have known simple phobias fixed in a short space of time but most concerns are coached out over several sessions. The best thing to do is seek professional help.